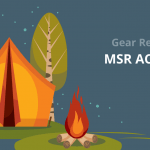 When you are looking for a functional bivy that is lightweight and small in size, it is difficult to find one that is a good weight that doesn’t require a lot of hassle. We hope this Outdoor Research Helium Bivy review will let you decide whether this bivy is the one. The Outdoor Research’s Helium Bivy outshines these other bivy bags that really aren’t much better than just using your sleeping bag. If you want reliability and light weight, but also like a little room and ventilation, the Helium is worth checking out. Weighing only 18 ounces, the Outdoor Research Helium Bivy is perfect for those that don’t want to be weighed down while travelling through the wilderness. Even though it has a minimalist design, it doesn’t lack for features that are functional and comfortable. It is completely waterproof with its Pertex Shield+ 2.5 layer membrane, plus it has a fully laminated floor and fully taped seams. It also breathes well in the hot and humid and you will stay dry while you are camping no matter what the weather conditions. With its clamshell design, the Helium encourages a good night’s sleep with its Delrin Single-Pole system that is the stabilizing force for the bivy. During pleasant weather, you can unzip the hood for added ventilation, plus it is a great opportunity to stare at the stars. You can also keep the bugs away with the No-See-Um mesh lining if you want to sleep with the hood unzipped. Additional features include stake down points to secure the bivy, an internal mesh pocket, and straps to attach to your sleeping pad. With a fairly standard design, the Helium is made of a pretty durable Hydroseal floor material and a thinner, waterproof Pertex Shield+ material on top. 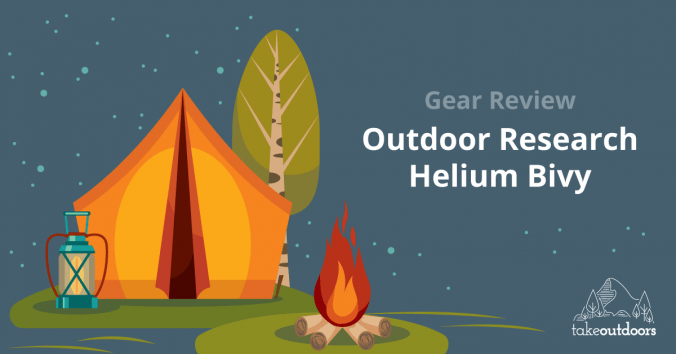 With a zipped opening found on one end of the bivy with a waterproof mosquito net hood that is separate and retractable, Helium is also equipped with hoops for two pegs at the feet and three at the head. The hoop sleeve has a Velcro opening on one end and is sealed at the other end, so you will be saving on your weight total with not having metal eyelets. If you were in a tent, the very thin plastic pole might be worrisome, but since you are in a bivy, you should be fine. The one difference between other hooped bivy bags and the Helium is that the hood itself hangs from the hoops and can be zipped around the bottom of the bivy instead of being zipped around the hoop and being pulled up from the base. Since the hoods hangs down, it actually falls over the opening, but there is a toggle that allows you to pin it up out of the way as you can’t roll it up. This can be a little annoying if you like to sleep with it open, it can hang down into your face and stop air flow. Your best bet is to try to peel the hood back over the hoop that you can bend slightly. The Helium is made of a durable 70 denier nylon floor that stands up well to rocks. The Helium does well in the rain and can withstand pretty sustained wind and rain with its 2.5 layers Pertex Shield+ fabric. The wind is also not a problem with the five-stake loops that pinned firmly to withstand strong bursts of air. The No-See-Um netting helps to keep out pesky bugs and it is removable for climates that have fewer bug issues. Since this is an ultralight bivy with a thin waterproof fabric, it won’t last as long as bivvies made with heavier materials unless you are particularly careful with it so it will around for a few years. At its peak, the Helium stands at 19.5 inches with durable Delrin plastic suspended from a curved pole. It creates headroom that is more comfortable in comparison to its competitors but still may feel cramped. Some people may tend to feel claustrophobic in tight places. If you are concerned about weight, you can get rid of the pole, but that will encroach on your breathing area. For added comfort features, sleeping pads can be strapped into place while you can easily open and close zipper from the inside and out. When you get inside the Helium, you will find that its small but doesn’t necessarily feel cramped. It doesn’t have huge entrances or extra area for your bags, but it will fit your camping mat, pillow, and clothes. Made with a new generation of lightweight, waterproof materials, the Helium Bivy is softer tot touch than the bivy bags that use Goretex. The Pertex Shield+ 2.5L is a little thinner and less expensive than Goretex but it has a 20,000 hydrostatic head rating that means is basically waterproof. It sheds rain and dew without a problem making it a good choice to use in wetter climates. It is pretty normal to feel sticky inside a bivy bag. Whether or not the material is breathable can be a big selling point as there is nothing like a lot condensation inside to make you feel uncomfortable. The Helium passes this test well with no condensation forming when the hood is open, and just a normal amount of condensation forms when it is closed, so you will notice it getting a little clammy. However, keep in mind that if you open up the hood, you will get enough ventilation with a light rain, but a heavy downpour will cause water to enter through the gap. The Pertex Shield+ 2.5L is a durable and waterproof material that works well in wet, wintry conditions. Since it sheds wet weather well, it’s a good choice for a wet weather climate, and the zipped hood can be closed up tight to keep out any winter weather. The Helium only weighs 18 ounces making it an average weight for a bivy bag, but a good lightweight one for a hooped bivy bag. When compared to traditional hoopless bivy bags, the Helium is still pretty average. The weight does not include the pegs which the Helium really does need to stand up, so you do need to factor in their weight to what you will be carrying. The Pertex Shield+ is a weight saving material that is much lighter than the traditional Goretex, or heavy, coated nylon that most bivy bags are constructed of. It also saves weight with the light plastic pole and not including metal eyelets. It packs down to around 4 by 15 inches so it is extremely portable and easy to take with you on a hike through the wilderness. The Rab Ridge Raider Bivy Sack offers you a little more space than its competitors. The upper layer is constructed of a 3-layer 40-denier eVent fabric that is very durable and has good breathability. The floor is made of a durable abrasion-resistant nylon that is good for setting up on rough surfaces. The bivy sack is equipped with one DAC Pressfit pole that allows you to hang material in the head area that gives you an internal height for a small shelter. You can carry the pole in an external sleeve and the bivy will need stakes to secure it upright. It also comes with six stake loops, plus a no-see-um mesh door that keeps the bugs out. 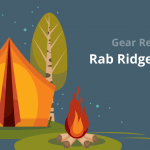 For lightweight hikers and mountaineers that are interested in a larger shelter than a typical bivy sack, the Rab Ridge Raider bivy sack is a good option that is just a little lighter and smaller than a single person tent. Suitable for backpacking, hiking, climbing, and mountaineering, the Rab Ridge Raider Bivy is a good choice for winter trips. In comparison to the Helium, the Rab Ridge Raider stands a little higher offering more space and comfort. They both offer good weather protection and condensation resistance, but the Helium is a little lighter and easier to carry. For a hooped bivy comparison, the Black Diamond Big Wall Bivy Sac is more similar to the Helium in its minimalistic design. It does not have the headroom of some of its competitors, and it does not use a pole system like the Helium. 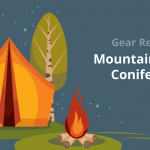 Instead, it features a sewn-in flexible wire that automatically suspends the material when you unpack the bivy sack making it a faster and easier bivy to set up. Made of the Todd-Tex waterproof and breathable material, the Black Diamond Big Wall Hooped bivy has good weather protections and decent breathability while lessening the buildup of condensation. The Todd-Tex material is close to Gore-Tex, but differs by using a PTFE membrane that bonds to the face fabric and internal fabric creating a three layer design. The Black Diamond also features a no-see-um mesh, taped seams, and a dual zipper. For those that prefer a minimalistic design, but also want a reliable shelter for any weather condition, the Black Diamond Big Wall Hooped bivy sack is worth checking out. It is suitable for climbing, mountaineering, and can be used as an emergency shelter. While it is easier to set up than the Helium, it does not have headroom and space that you find in the Outdoor Research Helium Bivy. Another high-quality minimalistic bivy is the Rab Alpine Bivy sack. If you need a reliable and lightweight bivy for a demanding trip, the Rab Alpine is a good choice. It is one of the lightest and smallest packed bivy bags on the market and includes a 3-layer eVent material that has good weather protection and breathability. The Alpine also features a durable floor made of 70-denier nylon for additional reinforcement. It does not have a pole system that suspends material from the head area with this minimalistic design. 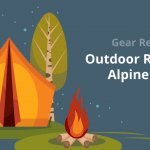 To fit technical sleeping bags, the Alpine is mummy shaped, but there is little condensation due to the eVent fabric even with such little space. The Alpine is a good option for alpinists and mountaineers since it works really well in the snow. The Alpine is lighter and smaller than the Helium, plus it works really well in the snow, but it does not have the space that the Helium provides. Another bivy from Outdoor Research is the popular Alpine bivy sack that is fairly light and provides decent comfort. This lightweight bivy is made of a 3-layer Gore-Tex Respiration Positive material has good abrasion and tear resistance. Condensation is rarely a problem due to the fabric, plus the floor is constructed with improved water resistance and durability. The Alpine does use a pole to suspend the fabric above your head, and the pole is easy to carry in a sleeve outside the bivy sack which is secured at the bottom with Velcro closures. Also, the Alpine comes with straps for your sleeping pad, an internal mesh pocket, five-stake loops, internal mesh pocket and a no-see-um mesh to keep out the bugs. The Alpine is a good bivy for hikers that want a reliable and lightweight shelter for backpacking, climbing, and hiking. Like the Helium, the Alpine provides great weather protection and durability, but the Helium has better ventilation with the zippered hood. The Outdoor Research Helium Bivy is a good option for those that want to save money and weight in their pack. This is one of the lightest bivy bags with a hoop on the market, so if you prefer a little more room and ventilation, the Helium Bivy will be a good choice. 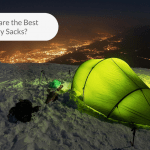 What are the Best Bivy Sacks for Backpacking?